Last week saw Alberta’s biggest land sale of the year. Large tracts of land prospective for Mannville CBM were posted. Energy firms bid a record C$544 million on petroleum and natural gas exploration rights in Alberta’s most recent land sale last week. Companies bid on 474,286 hectares (1 hectare=2.47acre) at an average price of $1147/ha. 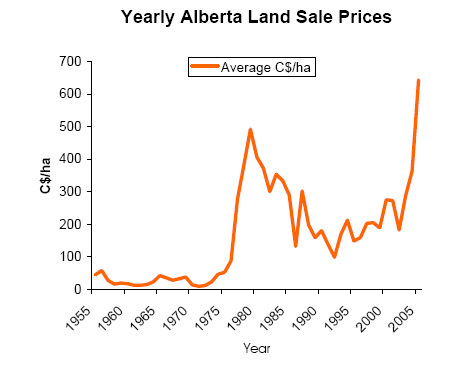 To get some perspective on this sale, I dug through the Alberta Energy archives and created a graph of yearly land sale prices going back to 1955. Land prices tend to track oil prices. The $1147/ha average of the last sale is off the scale of this graph. Tying up lands prospective for CBM is becoming increasingly difficult to negotiate or purchase. Acquisitions that seem expensive assuming were at the "top of cycle" may prove company makers if energy prices stay high.